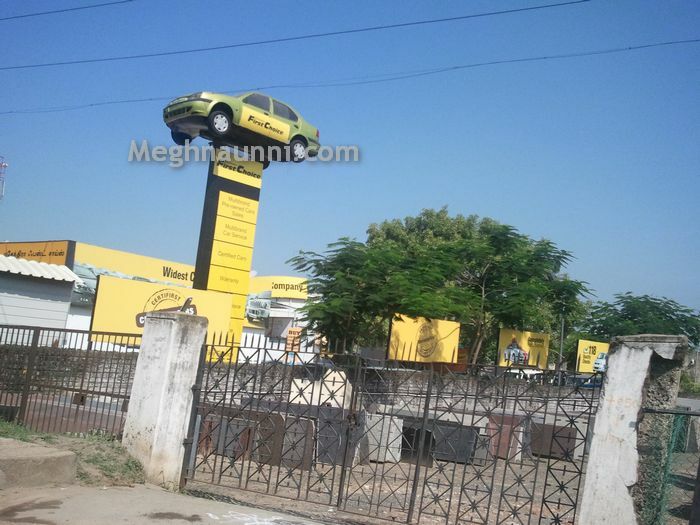 A story that occurred in my mind when I saw a car on the top of a column at the First Choice car showroom near Maduravoyal. There lived a man named Jack. He had a yellow car. The car was very much proud of itself. One day, Jack was going to his office in his car. As the car was proud, it did not like people owning it and driving it. So it refused to run. Jack thought that the engine had some problems. So he took the car to a mechanic shop to repair it and he left it there. The mechanic started working on it. But there was no problem in it. Actually the car was refusing to run. It did not have any problem. The mechanic was going on working on it to find the problem. The car did not like the mechanic working on it. So it told the mechanic that it did not have any problem. The mechanic became scared and he screamed and pushed the car. The car came rolling down and came to another big mechanic shop. The shop had a very big space. It also had many cars in it. They had a tall column in the shop. The yellow car came rolling and got stuck to the tall column. The mechanics came running and saw the yellow car stuck to the column. The yellow car was dead. The mechanic shop’s symbol was green. So the mechanics there painted the yellow car green. Till now the green color car is there on the tall column in the First Choice mechanic shop in Maduravoyal main road in Chennai, Tamilnadu, India.